Gutters are one of those things that often get neglected. They are surprisingly easy to become damaged, and most people don’t realize just how important they are to keeping your home safe from the elements of nature. With almost 4 decades of experience, Dowden Roofing can repair or replace your gutters with something more efficient and offer you advice on properly maintaining your gutters. Not all gutters come standard with a debris guard, especially those on older homes or ones that haven’t been updated in a while. You will often find the most leaves and debris in your gutters during the autumn months. The leaves fall at a rapid pace, and those pesky pine needles always seem to find their way into your gutters too. As these build up in your gutters, they obstruct the flow of water. 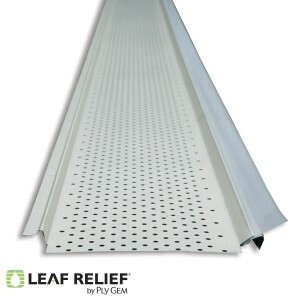 The gutter’s main purpose is to allow water to flow, and flow away from the house. 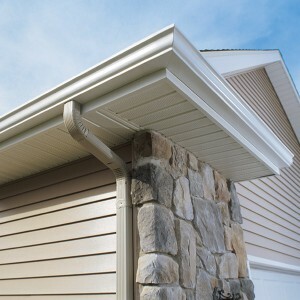 If the water can’t drain through your gutter and out the downspout, it will simply spill over the side wherever it can. This means all that water is being poured right near the foundation of your home. This is a common reason for flooded basements and foundation damage. The weight of this debris, especially once it becomes wet, can pull your gutters away from your house – not very helpful the next time it rains. Storms can damage gutters too. Anything from high winds and tornadoes to large hail storms can ruin your gutters. High winds can rip the gutters off your house completely or just enough to make them no longer efficient at their job. Large hail can cause dents in the gutters, which can lead to debris getting trapped, or when combined with high winds, can also pull them away from the house. At Dowden Roofing, we can install brand new gutters for you, and we’ll also install a gutter guard to keep leaves and other debris from blocking the water flow. Gutters come in many different colors, so we can make them blend in or match your house a little better than ones you might have had previously.